Liquid crystal (LC) cells consisting of a very thin (submicrometer) nematic LC layer switch with time response smaller than 1 ms. The total response time, i.e., sum of the turn-on and turn-off times, can be made as small as 1.3 ms. Such devices were prepared by a photoinduced anisotropic phase separation of mixtures of the LC and prepolymer. The formation of the LC-polymer bilayer in these devices was confirmed by polarized light microscopy and scanning electron microscopy. The phase separation method permits one to fine-tune the LC film thickness by varying the LC concentration in the mixture. This technique can be used to fabricate fast LC devices for TV and video applications. (C) 2005 American Institute of Physics. 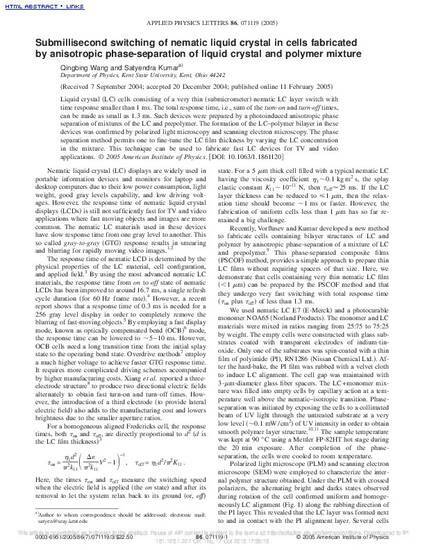 Copyright 2005 American Institute of Physics. This article may be downloaded for personal use only. Any other use requires prior permission of the author and the American Institute of Physics. The following article appeared in Appl. Phys. Lett. 86, 071119 (2005) and may be found at http://dx.doi.org/10.1063/1.1861120.